Works to remove the 19th Century Wood Veneer Floor from the Drawing Room at Bere Court and replace it with a periodically sensitively designed new oak floor was unanimously approved by planning committee Councillors on Wednesday evening. The works were called to committee owing to previous resident’s claims that the floor was a very early 18th Century parquet floor. The removal of the floor is required to remove extensive areas of asbestos that were identified in an asbestos survey report carried out in 2017. Our investigations with Japser Weldon, May 2018 confirmed that the floor was a wood veneer floor adhered to a timber substrate and the floor joists below the floor were 19th Century. Our thorough investigations and sensitive proposals were supported by Historic England and West Berkshire Council’s conservation officer. The consent will enable a major phase of asbestos removal planned later in February. The asbestos removal will make Bere Court safe for our client, their children and grandchildren to live in for many years to come. The earliest part of Black Bourton Church, the Chancel, was presented to Oseney Abbey in 1180 by Hugh de Burton and Ralphe de Murdac. The three lancet windows at the east end are unusual and distinctive of this period. The nave, north arcade and the font are from 1180, but in the 13th century changes were made to the north wall of the nave, including the addition of a north transept, and two lancet windows installed in the south wall. The earliest record of the village, Burtone, is in the Domesday book where the land is shared by three manors. The manor in the south of the village was held by Oseney Abbey, until the Dissolution when it passed to Christ Church. The manor in the north of the village came into the possession of the Hungerford family through marriage in the 15th Century. The Hungerford family suffered financial decline and after the enclosure most of Black Bourton came under the ownership of the Duke of Marlborough. James Lupton was Vicar from 1827 until his death in 1873. James Lupton persisted in the construction of a school to improve literacy in the village, and began the restoration of St Mary's in 1866. During the restoration the north wall was rebuilt and two lancet windows installed. The stained glass by Clayton Bell is from 1866. The restoration revealed pre-reformation wall paintings, however, before James Lupton could return from London to restore them, his curate chose to have the paintings white washed once more. It was not until 1932 that the wall paintings were finally restored. 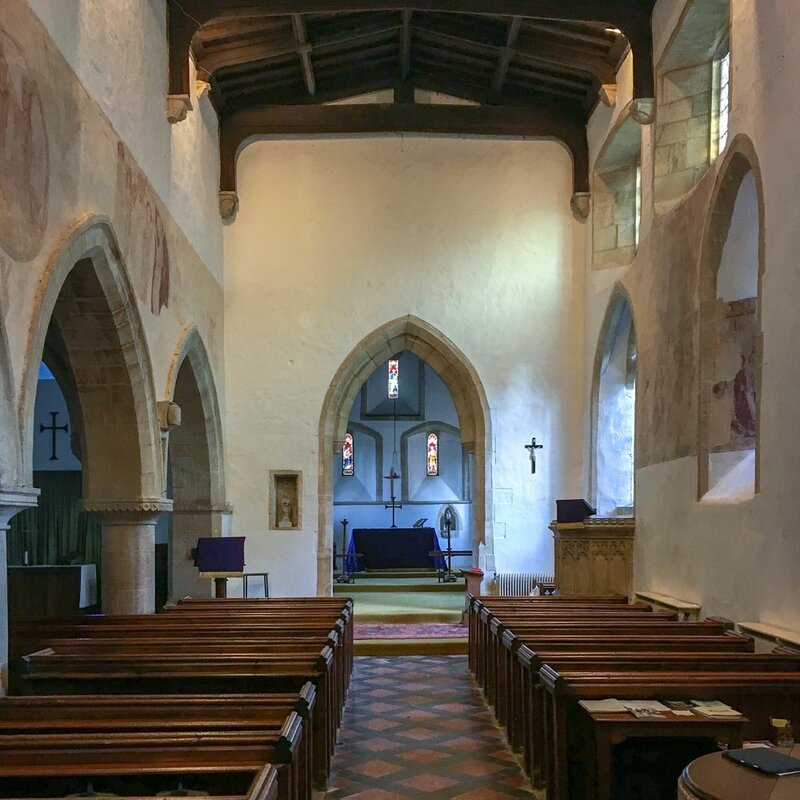 The wall paintings depict scenes from the life of the Saviour and from English history of the period - Saint Thomas à Becket canonised in 1174 and Saint Richard of Chichester canonised in 1262. After nearly 19 months of investigations, design work and negotiation, work has finally started on the reinstatement of the Old Cottage in Balscote, Oxfordshire. The works are being carried out by Oxfordshire contractor Alfred Groves and Son, who won the project having tendered for the second time in July 2017, to reduce costs. As part of a strategy agreed with conservation officer, Jennifer Ballinger, Cherwell District Council, the reinstatement work will see the external appearance and ground floor of the cottage restored to its pre-fire state, whilst the first floor and new roof structure will be constructed from modern materials in a sympathetic style. Mary Somerville back at the heart of Walton House, Somerville College. Departing Principal Dr Alice Prochaska had long wished to see the former JCR in the oldest part of the College, Walton House restored as a quality interior deserving of an Oxford College. The Mary Somerville Room a contemporary - period restoration of the old Dining Hall. James Mackintosh was appointed by Treasurer Andrew Parker to transform the room into a very elegant well-proportioned space in a periodically sensitive way. The aim of the project was to restore the space to how the Hall appeared in 1901 – its finest period of decoration. However, a true arts and crafts interior would have been heavy and masculine – in contrast later dates would have been too domestic. The brief for the detail developed with college archivist, Anne Manuel, was ‘classical with a hint of arts and crafts’.